After eight months of collecting dust, the storied bar at the Gramercy Park Hotel, a favorite spot of local celebs like Chloe Sevigny and Ethan Hawke, is finally reopening this week. The hotel’s new owner, the frighteningly well-connected financier Steven Greenberg, who once co-owned the Roxy and later the Palladium with close friend Ian Schrager, officially took over operations from the troubled Weissberg family on October 1. The bar is the first of the hotel’s four revamped public spaces to debut; a parkside lobby bar and a rooftop bar will follow shortly, as will a swank forties-style lounge Greenberg’s calling the Cobalt Club – for which he bought up the entire inventory of cobalt-blue glass at the recent Triple Pier shows. Nostalgic guests will find the once notoriously seedy front room much the same, save for the new crimson drapes and scented candles (lilac!) – though the piano and its regular player, Phyllis, are sadly missing. 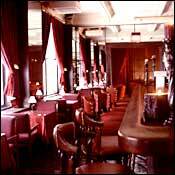 But behind the bar, Greenberg’s fashioned an adjoining lounge from what used to be the dining room, complete with Belle Epoque sofas and a dubious mural of the park. The effect is somewhere between Paris and pizza parlor.